One of the joys of staying with us is waking up to our amazing buffet breakfast in our continental restaurant. This lavish spread of food is included in the room rate for guests and is cared for with as much detail as every other part of your stay. Breakfast buffet items include; tea, coffee, juices, at least 6 different kinds of fresh bread, pastries, made to order omelet bar with all the trimmings, fresh fruits and vegetables, potatoes, rice, noodles, sauces, and even some typical Ghanaian Breakfast items. We will provide you everything you need to get your day started right. 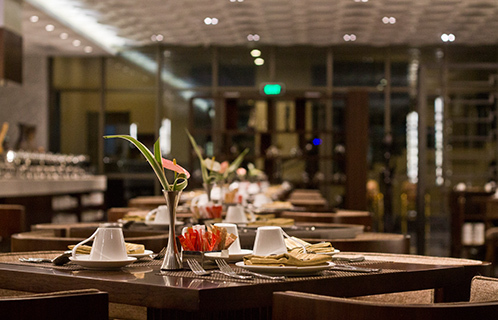 The Continental restaurant provides delicious lunch and dinner buffets; but it also provides an ala carte menu and a Teppanayaki/Hibachi grill station offering sumptuous meals and fine wines. Enjoy your meal in the restaurant, by the terrace or in your room. If you still feel peckish or fancy a midnight snack, our 24 hour room service can serve you up sandwiches and light snacks throughout the night.